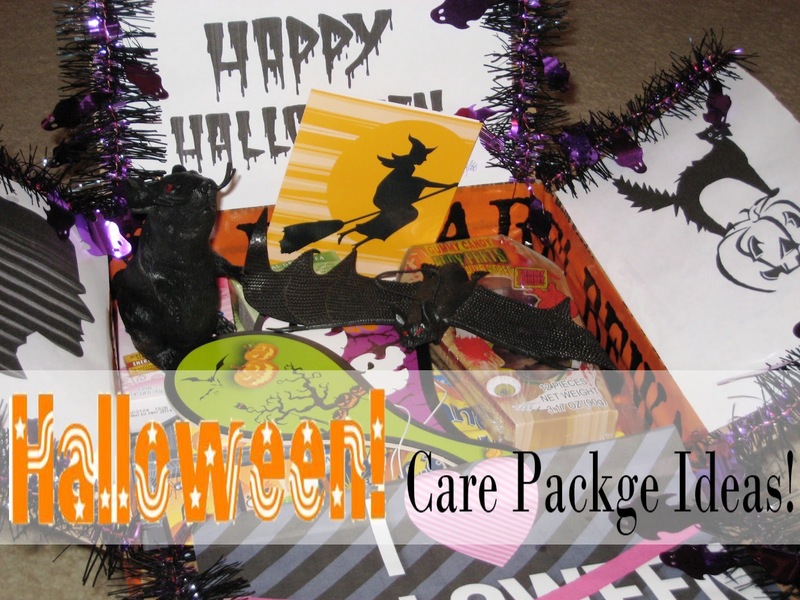 Ansley Designs: Halloween Care Package Ideas! As I'm sure y'all know, my Hubba Hubba is in the Navy and currently deployed. I'm trying to step up my game with the care package sending. I was pretty terrible at it last deployment. He wants one every 2 weeks, and I'm trying to keep up! I'm terrible at anything the requires pre-planning or a schedule! lol. Anyway, here's the Halloween themed care package I sent to him! The garland and "BEWARE" tape are from the Dollar Tree. I lined the inside box with the "BEWARE" tape. It's actually not tape, so I just used some of my own to make it stick. I cut the garland to length and hot glued them to the edges of the box flaps. 1 garland was just enough for this large priority mail box. The paper on the bottom inside of the box I made myself. It's just a plain sheet of printer paper. I wrote everything on there myself except for "scary" and "u" are stickers. "The SCARY part of Halloween is spending it without ....U!" I nabbed this cute little box at the Dollar Tree, also. I filled it with candy corn flavored taffy. OMG it was so good! I thought this box was perfect because Hubba is a nuke and that mad scientist reminded me of it! Glowing green nuclear waste anyone? Candy (of course!) - send his favorites!!! Mine likes candy corn a lot. So I sent him 2 bags of that and I found some candy corn flavored taffy! Some decor pieces so the sailors (soldiers) can get into the Halloween spirit. I sent a rat, a bat, and he can use that mad scientist box on his desk! Knowing my Hubba he probably didn't use any of the decor items, but it's the thought that counts! Normal items he might like or need. It doesn't ALL have to be Halloween themed! I packed in some crystal light packets that he can just add to a water bottle. Treats for the entire unit. I know some wives find out how many guys their hubby is in charge of/work with and they make little treat bags for each one! I've personally never done this (I know shame on me! ), but I think it's a great idea! I topped the goodies off with some creepy spider webs with tiny spiders over it. I thought this gave an extra element of surprise. When he opens the box he doesn't get to see his goodies...he has to dig for them! Then I closed it all up! I had extra BEWARE tape, so I used that on the outside of the package. I was worried the post office might make me remove it. I wasn't sure how they'd feel about mailing a package that said BEWARE! lol, but nobody said anything. I also love how you can see the garland peeking through the box! I would love to hear more ideas for care packages in general! What does everyone else like to send? P.S. you don't have to know someone to send a care package! For every military member deployed that gets sweet packages, there are plenty more who are forgotten and do not have anyone sending items. I did a little looking and this site seems the most promising. You send the care package addressed to the volunteer in the program with AnySoldier in the address somewhere. When they see "AnySoldier" they give the package to a soldier who does not receive any.